The Toronto Maple Leafs cleaned out their lockers today and held their final media availability of the season after losing their first round series against the Boston Bruins on Tuesday night. The team has now been ousted in the first round for three straight years and some tough questions are going to raised about how they can improve in the future while still paying top dollar for players like John Tavares and Auston Matthews. Another one of their expensive forwards will soon be Mitch Marner, who is heading into a contract negotiation this summer as a restricted free agent for the first time. GM Kyle Dubas today called the Marner contract “priority one” when speaking with reporters including Jonas Siegel of The Athletic, noting that he is going to do everything possible to try and get it done before July 1st. That is when Marner’s current deal would officially end, and potentially when he could sign an offer sheet with another team to drive his price up. It also is when the Maple Leafs could start their unrestricted free agent shopping if there is any to do, something that would be extremely difficult without knowing how much Marner will cost next season. Toronto is set to be one of the teams closest to the salary cap ceiling next year given their expensive core, and could very well need to move out some contracts to make room for Marner and the other restricted free agents—a group that includes Kasperi Kapanen and Andreas Johnsson. The team went through a disastrous negotiation with William Nylander last year that resulted in him missing a good chunk of season, something that Dubas and his front office will avoid at all costs this time around. Nylander never really did get his game back after sitting out for so long, and finished with just seven goals and 27 points in 54 games. Already committed to around $75MM for next season, the Maple Leafs will also likely not be able to afford to bring back Jake Gardiner. 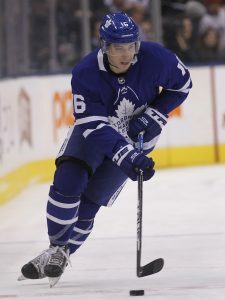 The veteran defenseman has played his entire professional career for the Maple Leafs organization after a trade brought his rights over from the Anaheim Ducks in 2011. As an unrestricted free agent Gardiner will likely draw plenty of interest from around the league despite his notoriety for turning the puck over at times (including one stark example in Tuesday’s elimination game), given his status as a top point producer. Gardiner has registered at least 30 points in a season on six different occasions, including a career-high of 52 in 2017-18. The biggest focus will be on Marner though, who just finished a 94-point season to put himself into the top echelon of forwards in the NHL. The fourth-overall pick from 2015 has 224 points in 241 regular season games and found immediate chemistry with John Tavares this year. He was also used in a penalty killing role for the Maple Leafs in the playoffs, only adding to his versatility and value in the upcoming negotiations. Everyone is injured to some degree if they’re still playing at this time of year, but every postseason there are a handful of unbelievable injuries that some NHLers are able to play through. The first such case in 2019 has come to light, as the Toronto Maple Leafs have announced that Zach Hyman suffered a torn ACL in his knee during the team’s first round series against the Boston Bruins. Hyman is scheduled to undergo surgery on Monday, after which the timeline for his recovery is at least six months. His status for the start of the regular season is very much in doubt. Hyman limped off the ice not once, not twice, but three times over the course of the Maple Leafs’ hard-fought seven games against the Bruins, but Hyman himself claims the injury occurred in Game Four of the series. Yet, Hyman continued to play for three more games, seemingly without a hitch. He averaged 18:07 average time on ice in the series, fourth-most among Toronto forwards, and recorded a goal and 25 hits. The skilled two-way forward played his role as best he could and Hyman is one of the few Leafs who have avoided a share of the blame pie since the team was eliminated. One can only imagine the pain that Hyman had to endure to continue playing on a torn ACL, which should only gain him further favor with the Toronto faithful. However, the team must now consider that Hyman will almost certainly miss training camp and possibly weeks or months of the regular season while he recovers. The 26-year-old winger is coming off of a career year offensively and that production, as well as his gritty style, will need to be replaced early on. Hyman’s $2.25MM cap hit will likely be off the books to begin the year, which should help the Leafs slightly with their cap crunch, but how the team will go about using their small amount of cap space while also properly accounting for Hyman’s potential absence will be something to watch for as Toronto shakes things up this summer. Two series came to an end last night as the Vegas Golden Knights and Toronto Maple Leafs will be heading home. With two more teams eliminated there will be a few minor moves over the next few days to fix rosters and prepare for the second round. As always, we’ll be right here to keep track of them. The Maple Leafs have returned Calle Rosen to the minor leagues where he will join the Toronto Marlies for their own playoff run. Rosen has been the Marlies best defenseman at times this season and won a Calder Cup with the team last year. He did not suit up for a game in the NHL playoffs, but may have a role on the team next season as Jake Gardiner and Ron Hainsey both head to unrestricted free agency. The Nashville Predators have sent Niclas Westerholm to the Milwaukee Admirals, after he served as the team’s third goaltender in the playoffs. The Admirals already have starting options, but after allowing 13 goals in the first two games of their series against the Iowa Wild perhaps they’ll consider Westerholm for game 3 on Thursday evening. We heard a few days ago that KHL forward Ilya Mikheyev was being pursued by the Vegas Golden Knights, but they’re not the only team trying to get him under contract. Today, Igor Eronko of Sport-Express has heard that the Toronto Maple Leafs are among the final few teams, while Darren Dreger of TSN includes Vegas and the Chicago Blackhawks as well. Dreger notes that a majority of the league has shown interest, and that a decision is expected this weekend. Mikheyev, 24, is a versatile forward that has played several seasons in the KHL with Avangard Omsk. This year he finished with 23 goals and 45 points, before putting up another 11 in his 13 playoff appearances. The 6’2″ winger is a great skater and plays his off-wing, allowing him to use his speed to drive the net and get shots away in tight. Whether that offense would translate to the NHL is still unclear, but teams are more than willing to take a chance. He will be limited to a one-year entry-level contract whenever he does sign, likely with some sort of agreement to get a chance at the NHL in 2019-20. Teams courting him may well include a European Assignment Clause, allowing him to return to the KHL if they try to send him to the minor leagues. That is of course unless Mikheyev is committed to the long haul in North America and is willing to work with a development team to maximize his NHL potential. The Edmonton Oilers continue their methodical search for a new general manager, and at least one candidate has received a second interview. That was Mark Hunter, according to Elliotte Friedman of Sportsnet, who notes that there are other candidates including ones overseas taking in the U18 World Championship. Hunter last worked in the NHL with the Toronto Maple Leafs, but returned to the OHL’s London Knights—which he owns with his brother Dale Hunter—after the team decided to promote Kyle Dubas to the GM position instead of him. He helped the Knights reach the OHL playoffs where many believed they would contend for a spot in the Memorial Cup, but the team was unfortunately knocked out after losing four straight games to the Guelph Storm in the second round. The veteran executive was named to the Hockey Canada Program of Excellence to manage the U20 National Junior team back in March, something that apparently is not stopping him from interviewing for the Oilers’ GM role. He was adamant that he wanted the Maple Leafs role when it came open in Toronto after Lou Lamoriello was moved out of the position, and obviously would give up his spot with London and Hockey Canada to take charge of the Oilers. Rumors swirled this week as Steve Yzerman was introduced as the new GM of the Detroit Red Wings, linking long-time executive Ken Holland with the Oilers. Cold water was quickly thrown on that by Darren Dreger of TSN though, who tweeted that Holland had withdrawn his name from consideration. Other names like Vegas Golden Knights AGM Kelly McCrimmon, Los Angeles Kings AGM Mike Futa and interim Oilers GM Keith Gretzky have all been linked to the job in some way, but it is not clear how many other candidate are being considered.